These easy dill pickle slices are perfect for burgers and sandwiches. Or chop the pickles and add them to deviled eggs, potato salad, or ​​Remoulade sauce. The pickles also make fabulous gifts for family, friends, and neighbors. Once you've completed this recipe, try pickling red onion, or homemade bread and butter pickles. Slice ends off cucumbers then slice in 1/4-inch rounds. 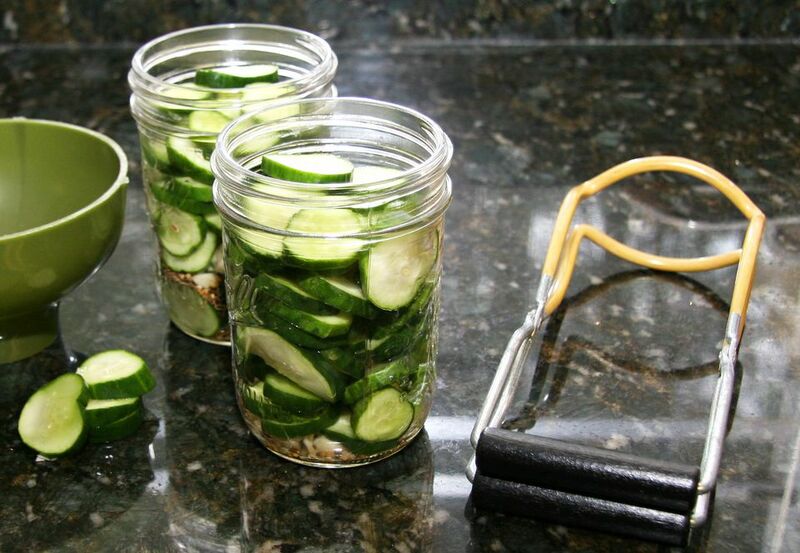 Put the cucumber slices in a large nonreactive bowl or pot* and cover with the 2 1/2 quarts of water. Add 3 tablespoons salt and stir until salt is dissolved. Cover and let stand for 12 hours. Prepare jars for canning and boiling water processing. Fill a boiling water canner half-full with water; add jars and bring to a boil. Cover and reduce heat to low to keep jars hot. In a nonreactive stainless steel or enamel-lined pot, combine the 3 cups vinegar and 3 cups water. Stir in 2 tablespoons sugar and 2 tablespoons of salt until dissolved. Bring to a boil. Into each of six 1-pint jars, add 1 teaspoon dill seeds, 1/2 teaspoon mustard seeds, 1 bay leaf, 3 or 4 peppercorns, and about 1 teaspoon of chopped garlic. Pack with cucumbers. Add hot vinegar mixture to each jar, leaving 1/2-inch of headspace. Wipe and spills off of the rims and threads of the jars with a damp paper towel. Fit with the lids and screw on jar rings tightly. Put the jars in a rack and lower them carefully into the hot water. If necessary, add more boiling of near-boiling water so the water level is at least 1 to 2 inches above the jars. Bring the water to a boil. Cover and boil gently for 10 minutes. Remove the jars to a rack to cool completely. About 24 hours later, check all of the jars for proper sealing. If you have a jar that didn't seal properly, refrigerate it and use it right away. Store in a cool dark place for a few weeks before using. After opening, refrigerate the pickles for up to 2 months.